What were you doing on Saturday 19 May this year? I think it’s quite likely that you were one of apparently two billion people throughout the world who watched on TV the wedding of Harry and Meghan in St George’s Chapel. 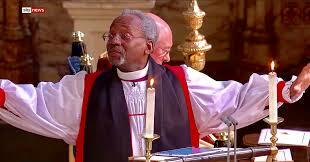 What did you think of the sermon by the Most Rev Michael Curry? It wasn’t typically CofE was it! Michael Curry spoke of the self-sacrificial love which sent Jesus to die for us on a cross and then asked us to imagine a world where love is the way: where love is the way in our homes and families, neighbourhoods and communities, governments and nations, business and commerce and in what he called ‘this tired old world’. It is my prayer that, as we prepare ourselves for Christmas 2018, we may come to a new understanding of the redemptive power of love.